Archimedes Inventions. When it comes to inventors and inventions, and particularly ancient inventions, Archimede's name comes up quickly - especially for major inventions. The Archimedes screw was perhaps Archimedes best known invention and often listed among the great ancient inventions. Best known because we know it worked - and worked well. As the story goes King Hieron II commissioned Archimedes to design a huge naval warship, the Syracusia. It was purported to be the largest ship built in classical antiquity. Since a ship of this size would leak a considerable amount of water through the hull, the Archimedes screw was purportedly developed in order to remove the bilge water. 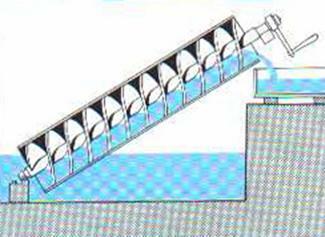 Archimedes' screw pump was simple and elegant. It had a revolving screw-shaped blade inside a cylinder and could be turned by hand. Why is the Archimedes screw listed as one of the greatest inventions? It is still in use today for pumping liquids and granulated solids such as coal and grain, in both the industrialized world and in the third world - where it is a preferred way to irrigate agricultural fields without electrical pumps. 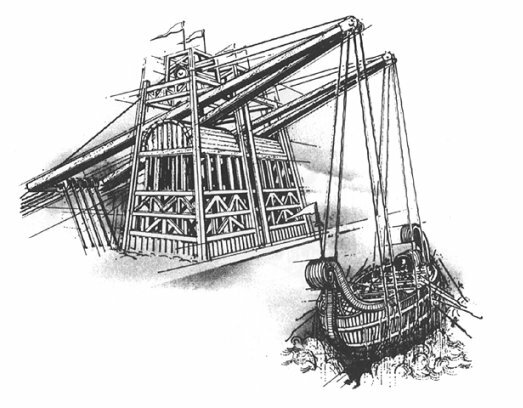 The Claw of Archimedes was a "ship shaker". It was reported to be used to defend the city of Syracuse. The claw consisted of a crane-like arms from which metal grappling hooks were suspended. The drawing here is an artist's rendition and we do not know the exact look. The claw defends a harbor by dropping hooks onto an attacking ship and then violently shaking the ship. In 2005 a television documentary entitled Superweapons of the Ancient World built a version of the claw and concluded that it was a workable device. Records of many of Archimedes inventions were probably lost when the library of Alexandria burned. And some of the inventions that we do know of have been questioned by modern engineers as seeming unrealistic. But Archimedes contributions to both inventions and mathematics are amazing. Cost Effective Small Business Patent Protection. Questions on on this site - please feel free to contact me.